Recently I helped a photographer to backup a large photo collection (several terabytes) from a Western Digital (WD) personal NAS MyBook Live. The My Book Live Edition NAS was released by Western Digital in 2011. They range in storage capacity from 1 to 4 TB. My Book Live features a 1 GHz ARM processor, 256 MB of RAM, and 1000 Mbit/s ethernet connectivity. Contrary to previous My Book Live versions it now features a fully fledged Debian linux distribution, whichs makes the My Book Live easy to customize and adapt to different needs. This assumes that you got SSH access to your My Book Live. If you haven't got SSH, then do the following to enable SSH access. Go to http://mybooklive/UI/ssh (case sensitive) replace "mybooklive" if you have renamed your My Book Live to something else, or replace it with its IP address. It's a hidden UI menu to enable SSH. Now you are able to ssh to your My Book Live via putty or another ssh client. Install the backup tool Duplicity etc. exclusive locking using flock - ensures that only instance is actice at the time. This is useful, when your backup might run for several days. bandwidth / upload limit using trickle. Then be sure to check your log files and do restore to check that everything is good. 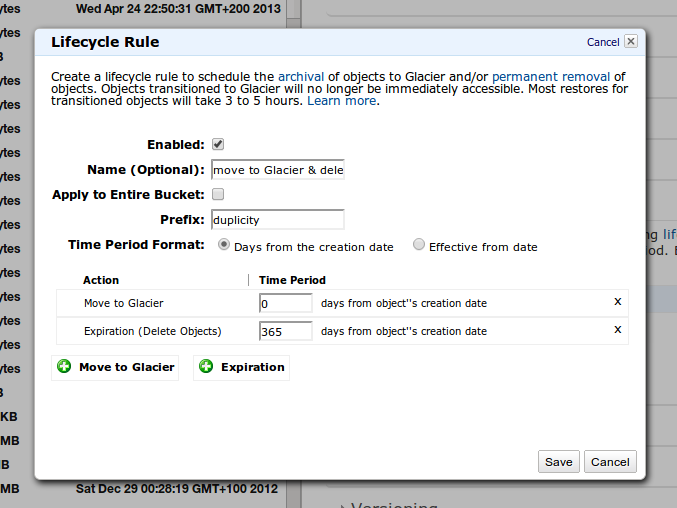 Amazon supports archiving of Amazon S3 Data to Amazon Glacier using lifecycle rules. I use the following lifecycle rule for Amazon S3 and Glacier.